Hi there, fellow Amazon entrepreneurs! We have talked much about Amazon fees, but I've never said a word about the FBA long-term storage fees, while it can eat a part of your budget. So, it's a nice time to dedicate an article to this topic. I hope my advice will be useful for everyone who is working as a FBA. As you know, there is an annual 'inventory cleanup' by Amazon from February 15 to August 15. 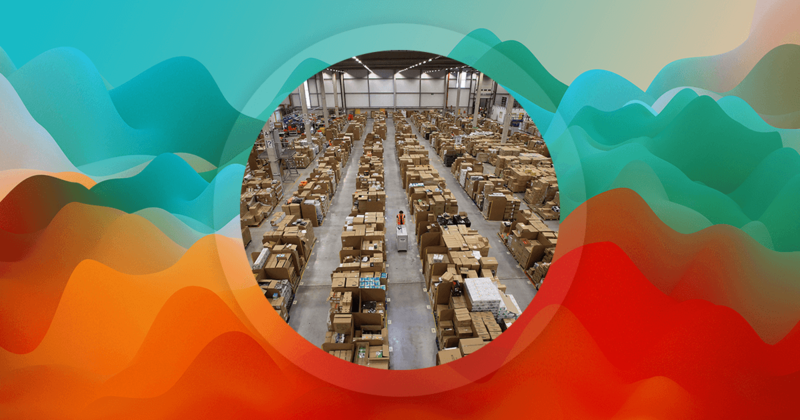 For all the items that are stored in the FBA warehouses for more that 6 months, Amazon starts charging a long-term fee based on the amount of space these items take up. 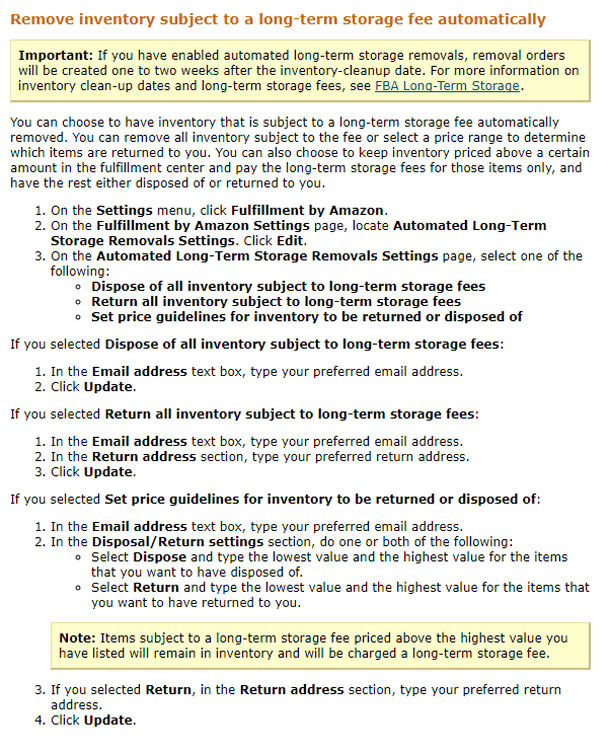 Of course, I doubt that any Amazon seller is happy with getting another fee, but are these Amazon long-term storage fees such a big deal? Sit beck and learn what do that fees mean to sellers and how you can overcome them. I've gathered the most useful details for you, dear readers! Why do such fees exist? Every seller may understand that companies want to improve their profits. That's why this fee exists. Amazon wants to get more profits from working with eCommerce sellers. They say that the company aims for selling items quickly, that's why they have created additional fees for storing some products for a long time. They already charge monthly storage fees due to the start of Q4, but they also say that the cost of storing items on their space is not built-in. Additionally, they tack on this a charge twice per year. However, you can avoid paying long-term fees to Amazon. They state that any item that is sold before storing for 6 months, or stores for this period but is sold before the cleanup dates (Feb 15 - Aug 15), won't be charged. If you submit a removal request for the items before that dates, it won't be charged as well. The good news is that the Seller Central gives us an opportunity to see the potential liability for FBA storages. Check the Inventory health report, Recommended removal report. I'll tell you how to use them later in this article. As I said before, Amazon charged FBA fees for the space taken by your products in their FBA storages. If you've stored your products for more than 6 months, you'll have to pay $11.25 for one cubic foot. If your items store for more than one year there, you'll be charged $22.5 per cubic foot (twice more!). These storing fees won't bring much damage to sellers who work with small items like toys, books and so on. Amazon charges a fee per unit in this case. Here is an example for a book (8x6x1 inches). The best scenario is that your items will fly off the shelves and just a small amount of them will be left at a FBA warehouse. Now, let's consider another situation... If you sell bulky and weighty things that don't make you happy with a great sales velocity, choose the strategy of liquidation. Remove your items from the inventory and return them to you before the cleanup dates. Also, if you have already worked with Amazon's FBA fees, check the changes they have done to their policy, especially to their 'seller-friendly' aspect in February. If earlier, one thing for an ASIN was always be able to avoid the fee, this is no longer the case. Amazon will charge ANY item that is stored for more than 6 months with their long-term fee. These fees are not created for getting sellers on Amazon by hitting those entrepreneurs with long-term storage fees. Actually, they can help smart businessmen to discourage less successful sellers from blocking and fouling FBA centers. That means that this affects the ability to store more better-moving items in the Amazon warehouses. This way, Amazon encourages people to sell more and quicker with these fees. Moreover, you can keep an eye on your storages, so you can see what will happen to your products stored on Amazon's warehouses. As a seller, you have access to several reports that help to determine whether your products are liable for storage fees. As I told above, these are: Inventory health and Recommended removal reports. If you download full reports, you'll see more info fields. I advise you to download them in order to get the most extensive details on your Amazon business. 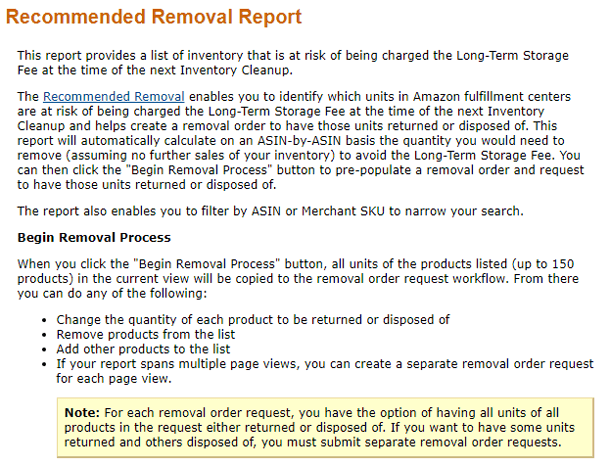 The 'Recommended removals report' shows items that would be affected by Amazon long-storage fees in 6 weeks before Feb 15 (the cleanup date). Sellers can begin the removal process by clicking the button with the same text on it. An order will appear, so you'll be able to choose what to do with those items: return them to you or dispose of them. Another option is automatic removing your inventory. If you don't want to remove every item automatically, apply this option only to bulky products. Fees for them can be really huge. 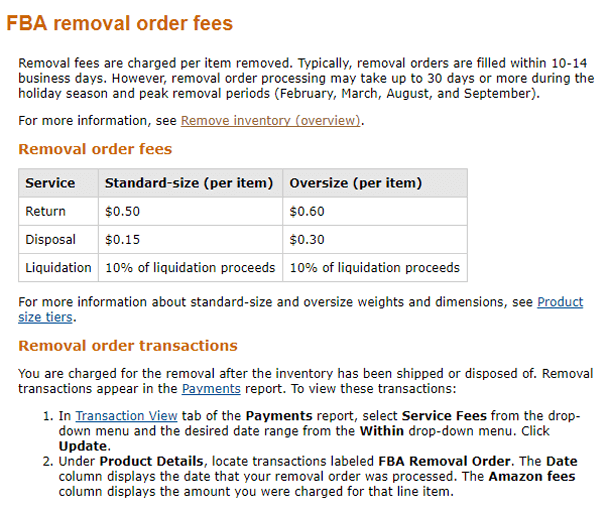 Keep in mind that such removal orders aren't free, as many other things on Amazon. Note that the fees for removing/disposing are charger per item, so the price will be the same for a pack of batteries and for a refrigerator. In case you have lots of small fees, think of paying the long-term storage fee to Amazon, as the disposal ones will be higher. There is a 3rd option - liquidating your inventory. This will end the lifecycle of products, and maybe you'll manage with recouping some initial costs. Those who work with slow-moving small items, may know that paying long-term storage fees costs less than removing or disposing, or even liquidating products. In case you work with large weighty products, it's more sensible to ship them back to you. Try to sell those things on other marketplaces and send them again to Amazon after some time passes and the time for their storing will be reset. You may pay some additional costs for that, and it will affect your final price, don't forget to re-calculate it carefully. Here is an alternative option of avoiding that storage fee. Send your shipments to the FBA centers so that they arrive after Feb 15 or/and Aug 15. 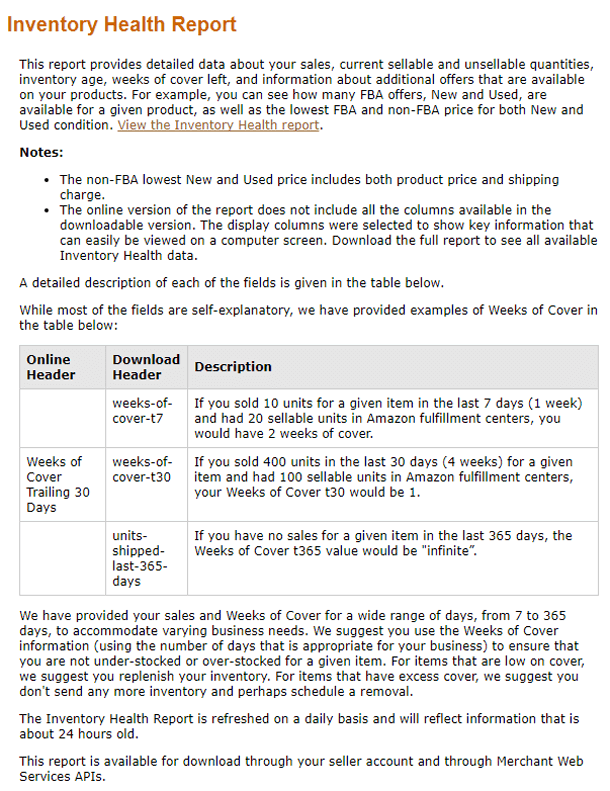 The earlier to this date your shipment arrives, the longer your things will store in the Amazon FBA inventories 'under 6 months'. Calculate the costs you need to pay for different fees at the initial stage in order not to be shocked later, when you see the huge charge from Amazon. Disposals and removals of small things cost you the same as for large ones, so there's no sense to pay for doing that with small goods. Calculate the sum, and decide whether to pay these fees, or is it better to pay the long-term storage fee. You can also remove your goods from your Amazon shop and re-ship them later. Don't hesitate to create the best timing for your shipments. Make sure that your goods will come to the warehouse just in the 'inventory cleanup' dates. This will increase the time of storing your things there. I wish you profits and good luck in avoiding fees! Subscribe to my newsletter, if you want to get more tips and tricks on working with Amazon!